"If an Indian injures me, does it follow that I may revenge that Injury on all Indians? "It is well known that Indians are of different Tribes, Nations and Languages, as well as the White People. "In Europe, if the French, who are White People, should injure the Dutch, are they to revenge it on the English, because they too are White People? "The only Crime of these poor Wretches seems to have been, that they had a reddish brown Skin, and black Hair; and some People of that Sort, it seems, had murdered some of our Relations. "If it be right to kill Men for such a Reason, then, should any Man, with a freckled Face and red Hair, kill a Wife or Child of mine, it would be right for me to revenge it, by killing all the freckled red-haired Men, Women and Children, I could afterwards any where meet with." TORCH BEARER AWARD - SRI CHINMOY PEACE RUN: August 7, 2018, Awarded in recognition of lifetime achievements in the promotion of human rights, in particular those of the Mi'kmaq. DOCTOR OF LAW DEGREE - HONORARY: October 8, 2013, Dalhousie University. Awarded in recognition of lifetime achievements in the promotion of human rights, in particular those of the Mi’kmaq. HONORARY DIPLOMA June 13, 2011, Nova Scotia Community College - Awarded the Diploma in Recognition of lifetime of promoting Human Rights. GRAND CHIEF DONALD MARSHALL SR. MEMORIAL ELDER AWARD: October 1, 2007 - Received the award in recognition and appreciation for outstanding contribution to the Mi'kmaq Community and Nova Scotia. MECNS Award 2006 – 2007: Multicultural Education Council of Nova Scotia annually honours a person that it considers to have provided exemplary service in the promotion and awareness of multiculturalism and multicultural education in schools, community, and government. ORDER OF CANADA: Named to the Order, November 17, 2005 - Canada’s highest civilian award. Introduction statement at the Investment Ceremony, October 6, 2006. "Dr. Daniel N. Paul is a powerful and passionate advocate for social justice and the eradication of racial discrimination. As an author, journalist, consultant and volunteer, he has been an outspoken champion of First Nations communities across Nova Scotia for more than 30 years. The Nova Scotia Human Rights Commission, the Mi’kmaq Native Friendship Centre and the Confederacy of Mainland Mi’kmaq have all benefitted from his consensus building skills and commitment to the community. Through his newspaper columns and his book, We Were Not the Savages, he has helped to restore the proud heritage and history of the Mi’kmaq Nation"
LISTED IN CANADA'S WHO'S WHO - BEGINNING WITH THE 2004 EDITION: Recognized for fighting for civil and human rights for humanity, and writing accomplishments, etc. 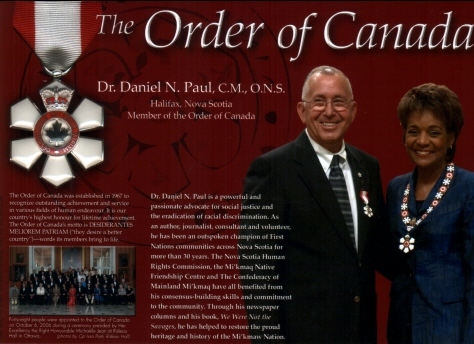 ORDER OF NOVA SCOTIA: Province of Nova Scotia, October 2, 2002: - the Province’s highest award for outstanding contributions, and for bringing honour and prestige to Nova Scotia. A quote from the Nova Scotia government’s press release announcing the award: Daniel N. Paul is a passionate writer who gives a voice to his people by revealing a past that the standard histories have chosen to ignore.... He has been recognized by the Universite Sainte-Anne with an honourary Doctor of Letters Degree and by the City of Halifax with a millennium award. By bringing new understanding and perspective to the past, he seeks to teach all people what damage racism can do. Millennium Award: Honoured by the City of Halifax, January 14, 2000, for contributing in a special way towards making the community a better place for its citizens to live and prosper in. Honourary Doctor of Letters Degree: University of Sainte-Anne, Church Point, Nova Scotia, June 7, 1997. Honourary citizen of the Acadien District of Clare Certificate: Honoured by the Municipality of Clare with it, March 22, 1994. City of Dartmouth Book & Writing Awards: Co-winner of First prize for non-fiction, 1993 edition of We Were Not the Savages, April 21, 1994. DISTRICT CHIEF - SHUBENACADIE MI'KMAQ DISTRICT: December 1988 to June 1990. Honourary title bestowed at the second annual meeting of the Confederacy of Mainland Micmacs. HIGH AMONG the most appreciated honours that I’ve received during my career are the dozens of small items, Eagle Feathers, tobacco pouches, letters, mugs, etc., given and sent to me by students as thanks for helping them better understand the importance of according all Peoples human dignity and respect. Profession:	Business Manager, Consultant, Counsellor, Author, Journalist and Reviewer. Professional Affiliation:	Writers Federation of Nova Scotia and member of the Canadian Committee of Genocide Scholars. The Confrontation of Micmac and European Civilizations: Published by the Confederacy of Mainland Micmacs, 1990.Out of print. Approximately 4,000 copies were distributed. The book became redundant when We Were Not the Savages was published. First Edition of We Were Not the Savages: Nimbus 1993. Out of print. A new edition, with much new updated material, entitled "First Nations History - We Were Not the Savages - Third Edition" We Were Not the Savages was published September 2006 by Fernwood. Compelling evidence about how the English used slavery and scalp proclamations to decimate First Nations populations is included. A fourth book, a novel, Lightening Bolt, was published by Fernwood Publishing October 19, 2017. It tells a story of Mi'kmaq civilization prior to the European Invasion. We Were Not the Savages has inspired a play entitled Strange Humours, and is cited as a reference by journalists, teachers and students in many articles, and high school and university papers. It is used as a text in Native Study Courses in many High Schools and Universities in Canada and the United States. It is also used as a reference by other authors when penning non-fiction historical manuscripts. In addition to the books cited, I've written chapters for inclusion in non-fiction books published by other authors, and for journals, human rights readers, school readers, and approximately 100 short stories and articles for magazines. I've also edited curriclum course material. From 1994 to 2005 wrote approximately 300 newspaper columns for the Halifax Herald and other papers and since then write occasional columns for it and other newspapers. Commentary covers issues ranging from the history and social affairs of the Mi'kmaq to the Canadian tax scene. Also have had articles published in news magazines, etc. Review books, essays, articles, scripts, and so on for publishers, individuals, newspapers, magazines, etc. Atlantic Canadian students in grades 8 or 9. Provides advice in relation to the application of the Indian Act and regulations made thereunder. Also in matters related to First Nation government, membership, fiscal and administrative management, federal/provincial relations with First Nation, etc. Prepare and deliver lectures to University, High School, and Junior High classes, teachers, service clubs, church groups, public servants etc. on Mi'kmaq history and human rights issues. The positive reaction I've received from these encounters, especially from students, are among my most prized memories. Appointed March 30, 2001. Duties of Board. (d) Make recommendations with respect to amendments to the Police Act or the regulations or to any other enactment dealing with law enforcement. After sixteen years of service I have had not a word of thanks from the Nova Scotia government for my service. Indefinite term. Authorized to administer oaths and take and receive affidavits, declarations and affirmations within Nova Scotia, in and concerning any cause, matter or thing depending or to be had in the Supreme Court and other provincial courts. Former member of the Mi'kmaq Governance Committee Member: Set up by the Mi'kmaq Chiefs of Nova Scotia to investigate differnet forms of self-governance and make recomendations for the implementation of such to the Chiefs. Former Member of the Council on Mi'kmaq Education, former Chair and Member: Set up by the government of Nova Scotia as a means for the minister of education to recieve recomendations from the Mi'kmaq community on ways to improve Mi'kmaq participation in the Province's education system. Canadian Committee of Genocide Scholars, February 10, 2012. Former member (14 years) of the Board of director's of the Micmac Native Friendship Centre in Halifax, the last five of which I was president. Former Commissioner on the Nova Scotia Human Rights Commission, 1988 - 1993. In concert with fellow commissioners administered and enforced the provisions of the Nova Scotia Human Rights Act. A former president and board member of the Public Legal Education Society of Nova Scotia. The Society was constituted for the purpose of educating the public about the laws of the country and how they may utilize them to protect their civil and human rights. Former Member of the Nova Scotia Round Table on the Economy and the Environment. A former member of the Student Aid Advisory Committee, Nova Scotia Department of Education. A former member of the Anti-Racism Advisory Board of the Metro United Way. A former member of the Nova Scotia Advisory Committee on Multiculturalism. Former director on the Board of the Jost Mission Day Care Centre. Former lay member of Nova Scotia Barristers' Society's self-governing body. Appointed to three committees: Discipline subcommittee "A" - This subcommittee, with its companion subcommittee "B," are charged with overseeing the ethical conduct of Nova Scotia Bar Members. Race Relations Committee - its responsibilities are to find means to establish equitable racial relationships within the Society and between the Society and the public at large. Nominations Committee, selecting candidates for the Society's executive. The Advisory Council advises the Dean of the Faculty of Law and the Director of the Law programme for Indigenous Blacks and Mi'kmaq on means to achieve the Programme's goal of providing access and helping students to succeed in the Bachelor of Laws degree programme at Dalhousie Law School, with a view to increasing the representation of indigenous Blacks and Mi'kmaq in the legal profession. Founding Executive director of CMM. I devised and registered the organization's constitution and bylaws and wrote and implemented the policies and directives required for its management and operation. Also drafted personnel and financial policies, job descriptions, and all other necessary tenets and procedures deemed necessary to operate a professional organization efficiently and productively. Duties included: the management of the organization, i.e. setting up and overseeing accounting procedures, budgeting, planning, negotiating for the assumption of control by CMM of programs from federal government departments and the establishment of methods to insure the timely and professional delivery of these services to Mi'kmaq communities. Supervised 25 professional and nonprofessional staff, including individuals who held degrees, or other professional designations in such variable fields as finance, technical services, planning, band government, economic development, education, and land claims research. The budget of the Organization during my term of office averaged four million dollars per fiscal year. I liaised and negotiated on behalf of the Confederacy, its Band Councils and individual Band Members, with federal and provincial government ministers and their staffs, and officials of other private and public entities for funding, resolution of aboriginal rights issues, related legal problems, etc. The organization's annual audits, as per the requirements of the Nova Scotia Societies Act and the terms of contractual arrangements with funding agencies, was carried out by chartered accountants. During my term of office the opinions expressed by the Confederacy's auditors were unqualified and the organization was in the black at the conclusion of each fiscal year. The overall performance of the organization was rated by Indian Affairs and by many peer groups as one of the best in Canada. Also, during my term, I founded and published the Micmac/Maliseet Nations News. Distribution; 4,000 copies monthly - readership, approximately 25,000. In addition to publishing duties I wrote editorials for the paper and much of its copy. Founded and was Chief Executive Officer of the Mainland Micmacs Development Corporation. What I consider the proudest accomplishment of this endeavour is that I, in conjunction with the Confederacy's legal council, worked out a Constitution for the Development Corporation that makes all the members of the Bands associated with the Confederacy, during their lifetimes, the shareholders. Preparing job descriptions, retaining, training and supervising staff. Identifying financial and human resources required for the ongoing operation and administration of the Program. Preparing work plans and operational plans for the future delivery of the Program to Bands. Overseeing the day to day activities of the Program. Ensuring that the Crown's, trust responsibility to manage Indian Reserve and other land and legal matters with Indian interests, including renewable and non-renewable resources, was addressed in a competent and judicious manner. Ensuring that responsibilities pertaining to Indian estates, Band membership and statutory requirements were diligently attended to. Identifying staff training requirements for the Program and acquiring resources to meet the need. Providing departmental interpretation of the Indian Act and regulations listed thereunder to interested parties and staff. Attending and participating in meetings with Band Councils, Band staff, First Nation organizations, provincial, municipal and federal government departments and so on for the purpose of resolving problems encountered when enforcing the provisions of the Indian Act (trespass, removal of materials, etc.) and the protection of the First Nation lifestyle and environment. Directed, administered, and controlled the local government functions of the district office. Supervised the local government Program staff. Identified financial and human resources needed for funding and implementing programs at the Band level. Allotted and delivered funds to the Bands for the ongoing provision of services provided for under contribution arrangements and agreements. Estimated the human and financial resources required for ongoing transactions of the Band Operations Program by preparing five years administrative and operational work plans. Performed all the requirements for the present and future operation of the Program. Required to act as District Manger on numerous occasions supervising the activities of 59 professional and nonprofessional employees. Personnel policies and job descriptions. Housing proposals, policing proposals, and, other matters pertaining to Band local government. Acted as electoral officer for band elections and referendums, participated in surrender and de-surrender meetings, advised both Band Councils and members in the application of the provisions of the Indian Act and in regards to their rights and obligations thereunder. Advised and assisted departmental personnel with preparing yearly estimates of financial resources needed by Band governments to provide their communities with basic services. And, interpreted and explained to Bands and their membership the revolving changes in departmental programs, policies, procedures, and resources. In this position I acquired extensive experience in counselling and assisting individuals in their efforts to resolve housing, education, social, child care, legal, and at one time or another just about any problem an individual can encounter. Also, in this position I was required on many occasions to assume the duties of Band Financial Advisor - performing Band audits and providing assistance to Band Councils in finding ways to resolve financial problems. During a three-month leave of absence from the Department, acted as liaison officer for the Union. Participated in negotiations and other exchanges with federal, provincial and municipal governments, their agencies, and also private organizations and businesses. Assisted Band councils and Band members in preparing and assessing the viability of loan applications, and provided advice to aspiring entrepreneurs on how to apply sound business practices and procedures. Responsibilities included: reconciling monthly computer statements and imprest accounts, preparing vouchers and maintaining batch control, etc. Also was required to perform Band audits, set up bookkeeping systems for Band council operations, and review Band financial and administration activities. During my first year with the Department I occupied several clerical positions, i.e. acquisitions and construction projects clerk. 1968 - 1971	Employed as Chief Bookkeeper with Non-Public Funds, CFB Stadacona, Halifax, Nova Scotia, supervised nine employees. 1968	- 1968	Construction company paymaster, prepared payroll for approximately 300, supervised three employees. 1967 - 1968	Attended upgrading courses in architectural drafting. 1965 - 1967	Employed as machine foreman for Moir's Limited, supervised 18 employee. 1962 - 1965	Employed as accountant and credit manager in a retail services operation. 1961 - 1962	Assistant Accountant with a meat packing operation. In this position was also required to perform cost accounting duties. While filling the before mentioned positions, I acquired extensive experience in the accounting field. In two of them responsibilities included the preparation of monthly and annual financial statements. At Non Public Funds the accounting was accomplished with the use of bookkeeping machines. Separate financial statements were produced for each of the 27 different outlets, (restaurants, clubs, exchanges, etc.) that were part of the operation. The overall operation had a yearly cash flow of approximately $3.5 Million. 1947 - 1951 Indian Day School, Micmac Reserve, Shubenacadie. 1960 - 1961 Success Business College, Truro. 1961 - 1970 Various upgrading courses sponsored by CEIC. and Indian Affairs. 1970 Wrote and passed the Provincial exams for an equivalency high school diploma. 1971 - 1993	Have on an ongoing basis taken courses provided by the Federal Public Service Commission and other agencies to continually upgrade skills. The latest in 1993 in writing and editing procedures. On an overall scale could best be described as self-educated. I enjoy reading practically any type of book, and most any other kind of reading material, as a result I read profusely, when time permits. Bowling, swimming, and walking are my favourite pastimes outside of working and reading. The author of a best selling and prize winning major history on the confrontation between Mi'kmaq and European civilizations, We Were Not the Savages. The first such history ever written by a First Nation citizen. While Executive Director of the Confederacy, with the able and professional assistance of the late Kathy Knockwood, established, what has been described by education professionals, "a first class post-secondary education Program." The rules and regulations of the Program that we developed have been adopted by many similar organizations across the country. After we implemented the Program the registration in post secondary education facilities of students from our six bands went from approximately 20 to more than 200 students within three years. Started a collection of Mi'kmaq artifacts at the Confederacy offices in 1989 that include ancient arrowheads, axes, dolls, snowshoes, and so on. Founded in 1991 the Micmac/Maliseet Nations News. Distribution when I retired was 4,000 copies monthly - readership, approximately 25,000. In addition to publishing duties I wrote editorials for the paper and much of its copy. The paper is still published. Founded and was Chief Executive Officer of the Mainland Micmacs Development Corporation. I consider the proudest accomplishment of this endeavour to be that I, in conjunction with the Confederacy's legal council, worked out a Constitution for the Development Corporation that makes all the members of the Bands associated with the Confederacy, during their lifetimes, the shareholders. Founded and became president of the Micmac Heritage Gallery. The Gallery was located on Barrington Street in Halifax and specialized in retailing the labours of Nova Scotia Mi'kmaq artists and crafts persons. It also retailed the artistic efforts of Native American producers from across Canada and the United States. I took the lead role in overcoming the bureaucratic nightmare surrounding an addition to Yarmouth Indian Reserve. Also, I headed up the successful efforts to resolve, other reserve land addition matters, disputed right-of-ways of various natures, decades old estates, and so on. Acquired road right-of-ways into reserves that had not been provided with such. Resolved favourably on behalf of the Chapel Island and Millbrook Bands illegal encroachments by NS Power upon their respective reserves. Both Bands received considerable monetary compensation. Instigated and headed up the successful effort to resolve the Afton Band's 170 year old Summerside property claim. The property is now a Reserve. 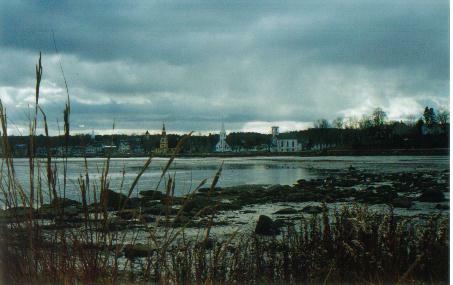 Worked for 11 years on the project which saw the Pictou Landing Band's claim known as Boat Harbour mostly resolved. This claim centered around the use of the Harbour as a lagoon for the industrial waste spewing forth from the Scott Paper mill at Abercrombie. The Band eventually settled for $35 million plus. My book, "We Were Not the Savages" published by Fernwood publishing, Halifax, October 1, 2000, relates in more detail the before mentioned. During my term as Executive Director with the Confederacy I instigated a drive which raised funds for a new community centre for Indian Brook Reserve. During my stint as fund raiser we raised approximately $3 million. Since it opened, the Centre has become a major source of revenue for the band. During my stint as Executive director of the Confederacy I started a trust fund which was set up for the specific purpose of addressing the future legal requirements of the six Bands associated with the organization. When I retired from CMM in January of 1994, the fund had a balance of $140,000. This was the first undertaking of this nature by a Native band, or organization, in the Atlantic provinces. Without remuneration, except for some travel expenses, have been featured in videos about the life and times of the Mi'kmaq and about anti racism procedures which were prepared by the Public Broadcasting T.V. station and by Mount Saint Vincent University, CBC. etc. In 2001 was featured in two videos, Growing Up Native by CBC and EASTERN TIDE “Expulsion and the Bounty Hunter” by Bear Paw Productions, in 2003 had a major role in another documentary entitled We Were Not the Savages, by Bear Paw. Worked, and continue to work, with Native and minority groups to overcome racist practices and other forms of intolerance in Nova Scotia. The accomplishment that I'm most proud of is that I've lobbied successfully to have the names of buildings, roads and so on, named in honour of colonial officials that brutalized the Mi'kmaq, changed. Established at my own expense an internet Email network that distributes to students, teachers, and the general public, across North America and worldwide, free of charge, historical information about First Nations, cultural events, etc. Also established in 2003, and maintain at my own expense, a Website, www.danielnpaul.com featuring First Nation cultures. I did it for the express purpose of using it as a tool to help educate non-First Nation Peoples about our People’s histories. It features Mi’kmaq and other First Nation history highlights, paintings, photos, etc. It’s widely used, free of charge, by students, teachers, historians, and the general public across North America and worldwide. It now receives over 7000 hits a week - passing the 937,000 mark in a little over five years.